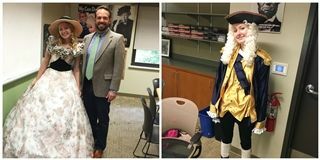 Throughout the 2016-2017 school year, junior Paige Hellinger attended every one of her U.S. History classes dressed as a historical figure. She came up with the idea for the project, called A Paige in History, in the beginning of the year while students were joking about ways to get out of the final exam. Mr. Consuegra liked the concept and the challenge was on. Class after class, Paige dressed as a different historical figure, from Marie Antoinette to a Civil War soldier and everything in between. If she missed a class due to illness, Paige texted photos of herself in costume, including an apt photo of her dressed as Typhoid Mary. If she came to class as a lesser known historical figure, she read a short bio to her classmates. For the final day of class, she appeared as Scarlett O'Hara from Gone With the Wind, requiring assistance getting the costume through the door. The elaborate dress was sewn by hand and took days to complete. "I'll never forget it, that's for sure!" said an impressed Mr. Consuegra of Paige's achievement. He did indeed allow her to opt out of the final.